Before getting into the details of Minetest server, here is a link list highlighting builds in our Minetest world. These are links to screenshot posts in this thread that showcase various builds. Note: 2017_03_15 Dropbox changed its file sharing so some links that used to be listed above lost their images. If your post was once on the list above, it was removed from the list because the image links in your post are dead. Contact me with the post link and please update your image links to ones that work. 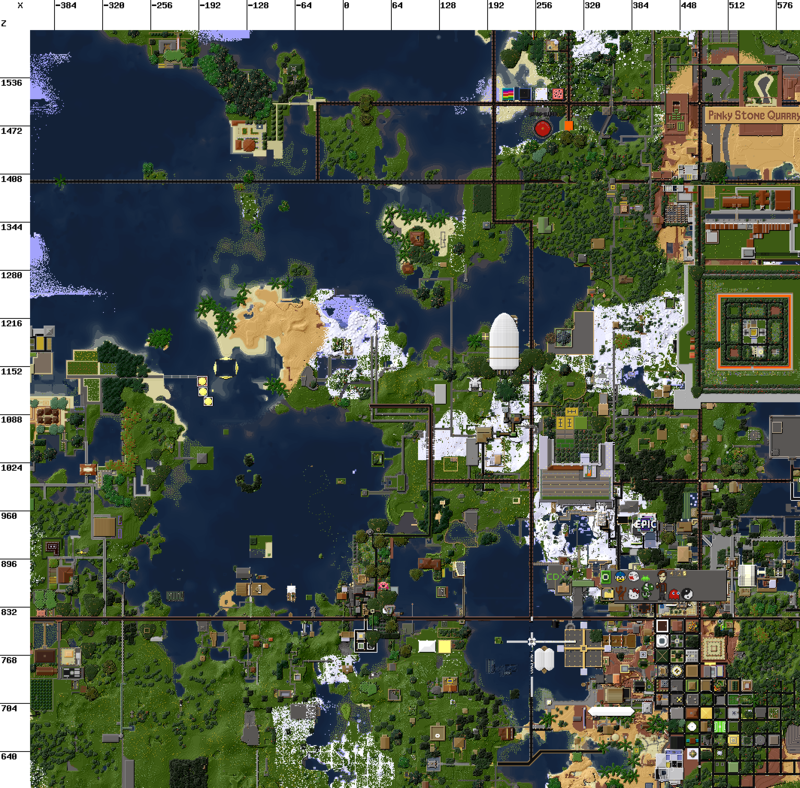 Our Minetest server runs in survival-mode for some degree of challenge but it is not a battle server. Player-vs-Player has been disabled. 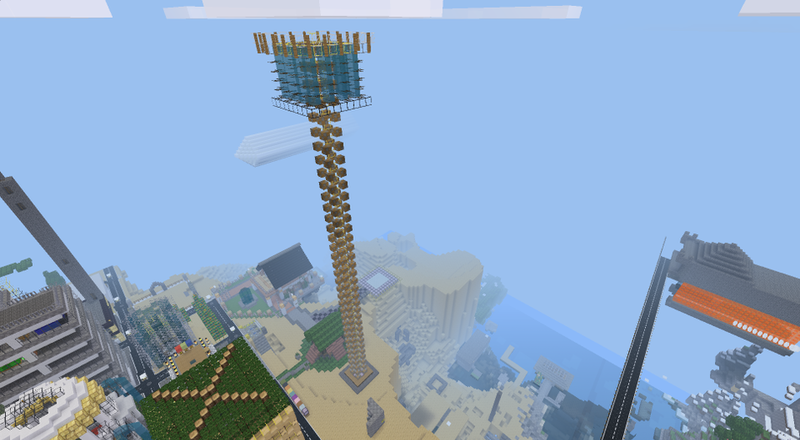 Instead, the focus of our Minetest server is on building. Our server is not a pillage and plunder server and not an anarchy / chaos server. 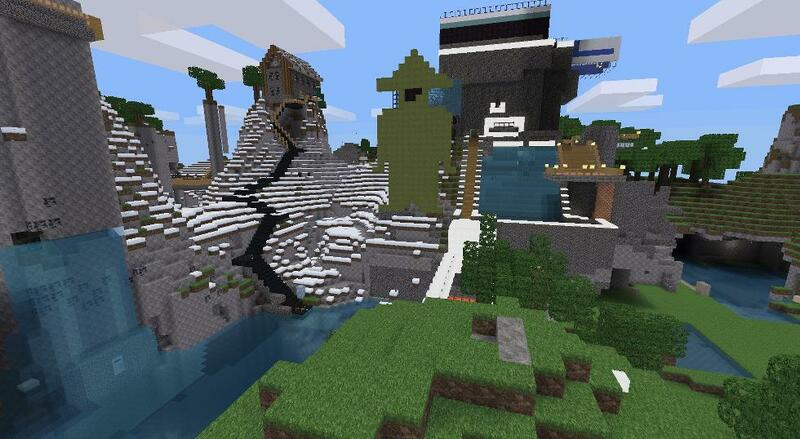 The server is monitored, the rules are enforced, and bans are permanent. While our community strives to keep the server family-safe, the players are not babysitters and the server is not a day-care center. Please do not leave children unattended to dig at every object in sight; a singleplayer world is much better suited for that instead. By "family-safe", I mean that the server is monitored, excessive crude language and rude behavior are not acceptable, and discussing topics unsuitable for polite company should be done on someone else's server. It is unfortunate that good manners and decorum are in such decline among online communities that I have to spell this stuff out. We strive to keep our Minetest server a family-safe place. Good players are good neighbors and caretakers. The general rule is: "If you didn't make it, don't take it." No lagging through protected areas, this is a violation of community trust. No swearing, inappropriate topics, or foul-language. No inappropriate, gross, or foul-language player names. No excessive arguing. It really ruins the fun for everyone else. No excessive use of all-caps. No dating, flirting, sexting, or trying to court other players. Respect the build areas of others. Do not mine, harvest, or build near their structures and the open spaces around them. Players caught using CSMs (client-side mods) that can be used in any way to cheat, steal, grief, abuse players, abuse the server, or anything else that causes problems for players and admins, will be banned. For those players who want to argue these points I'll keep it real simple for you - you can be banned at any time without notice. If you are suspected of using a hacked client you will be banned on sight. Be cautious when discussing topics of religion, politics or any topic that results in a heated argument. Our server's players come from many different parts of the world and many different faiths and many different walks of life. The one thing they all have in common is that they come to our server to stack blocks in peace. Do not push too much and know when to back-off. If I have to step in to quell an argument, bans are the usual result. Some of our best players are not great builders but they are good people and good neighbors. They are "caretakers". Caretakers take care of our community. They don't have to be admins or moderators warding off griefers and trouble makers. They are positive role models, they lead by setting a good example for others and are pillars of our community. They possess humility, grace, and the personal experience of "to err is human". They know when to be firm and when to be forgiving. They are willing to give a hand but not always a "hand-out". They are there to greet new comers and "welcome back" returning friends. This hopefully gives you an idea of what type of community we are striving for. Privs are granted based on merit and good behavior. the other servers to know about admins. LazyJ and Miner_48er to determine if you are eligible or not. player has not caused any problems. "Fly" is granted after a few months of observation for good behavior. has proven to be a pillar of our community. Privs higher than these are at moderator and admin levels. ShadowNinja's 'Areas' protection mod is installed. Players, themselves, can now set protection on their own builds. No sign-up is required. Enter an appropriate name and password of your chosing in Minetest's Multiplayer menu. Names beginning with numbers or are all numbers only are blocked. The playername "Admin" is blocked; please use a different playername. If you don't want to spend a few moments to think of a decent playername, then you won't have the patience to play on our server. 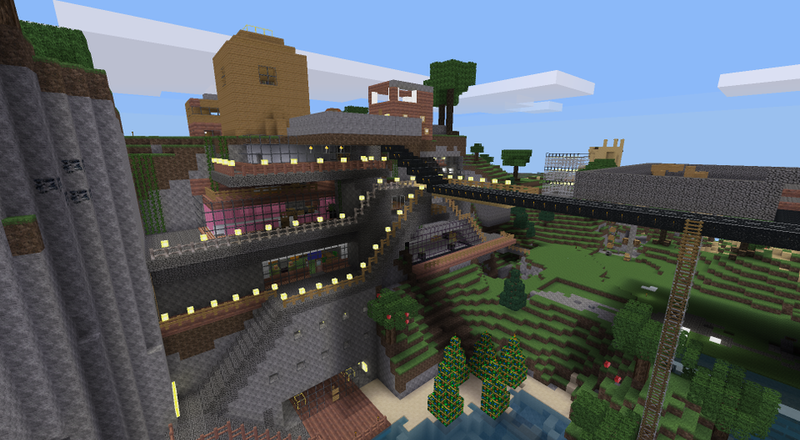 Our Minetest server is setup for full-sized monitors and PC's with real keyboards and mice. iPads, tablets, Kindles, and smart-phones will not be able to access all the controls in some menus or F-number key functions. We are currently running the 2016_09_14, development (unstable) release of Minetest 0.4.14 on an Ubuntu 16.04 LTS, 4 virtual core, 8gb RAM, virtual private server. If you connect with a Minetest client older than that date you will see a warning message saying your client may not be fully compatible. You may have to wait a few days for a more up-to-date Windows build to be released. Our server uses strict protocol version checking so Minetest doesn't have to do more processing to try to accommodate older versions. Players' clients *must be* within the same version series to connect to our Minetest server. #minetest - This is the channel that is piped into the game. In-game chat and IRC chat go back-and-forth. #LinuxGaming2 - This is the channel to use if you want to chat outside of the game and not be interrupted by young players who don't yet know what IRC is and don't want to be asked "can i liv wit u" or "ware r u" every time you chat with someone. Accept invalid SSL certificates. For now we have to use self-signed certificates. Use SSL for all servers. If you are using the non-SSL connection, port 6667, then you don't need any of that SSL setting stuff. There are several, free chat programs available for download such as XChat for Linux (should be in your repositories; if not, try XChat's homepage) or its more frequently updated clone, HexChat (HexChat is FREE for Linux and Windows). If you would like to try IRC chat without installing any additional software, you can use your web browser instead. Go to KiwiIRC, enter a nickname, skip the "Start" button, click on the small blue text that says "Server and Network", enter the server and port info above, then click on the "Start" button. LinuxGaming runs a custom version of minetest_game, has a few custom mods, and most of the other mods have been tweaked. 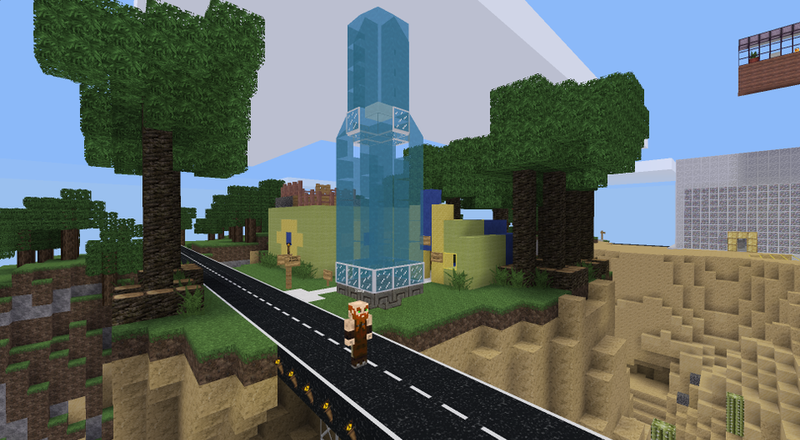 The list below contains some of the more recognizable, big-name, Minetest standard mods. 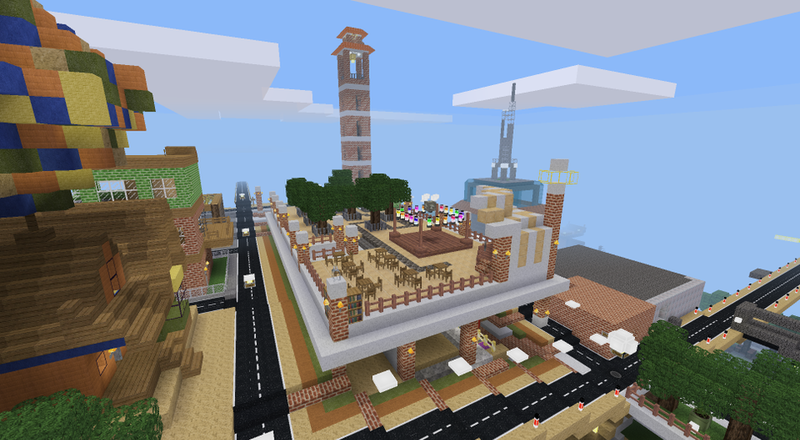 "MoreBlocks" - provides many different shapes and extra blocks to build with. "MoreTrees" and "PlantLife" - provide a variety of trees, wood planks, and plants. "TravelNet" - provides elevators for players to teleport vertically through. The omni-directional teleport booths can only be set by admins. "Unified Inventory" - a feature-rich inventory manager. "Destinations" - a custom mod for chat-command teleports set by admins. "MoreBlocks Legacy" - a really old version of "MoreBlocks" that was used when the server first started years ago (kept to preserve the old blocks, and the old builds created from them, that didn't convert in newer versions). No world wipes. 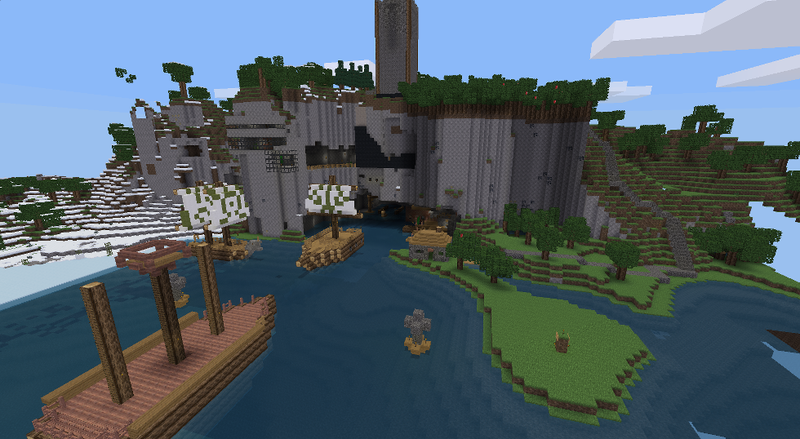 LinuxGaming2 is one of the oldest surviving online worlds in Minetest (created back in April, 2013). Interact on join. No sign-up process required. In-game global chat interface with our IRC server. PvP damage has been disabled to prevent players from killing each other or accidental player damage done while working too close to each other. The only ways to get hurt are by falling or touching lava. The full-sized version of Unified Inventory is used. Crafting recipe outputs have been increased for most building materials. 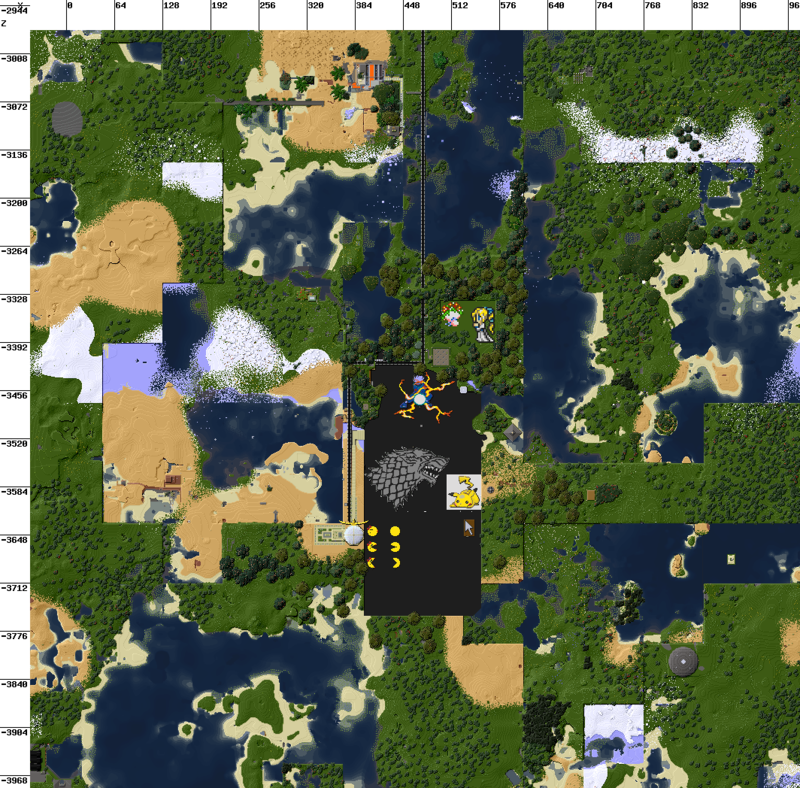 Almost every mod on our server has been edited and tailored to suit our unique Minetest server. Screwdriver requires a special priv to use. Occassionally the server is closed for several hours to run clearobjects. Clearobjects clears the world of all dropped items (litter). Over time this stuff builds-up and causes lag so we have to clear it out. Even with the built-in feature to remove items after several seconds, that feature doesn't clean-up everything so clearobjects is still necessary. Our server is a work-in-progress. It is also a very customized server. As such mod updates take awhile to test, edit, and tailor to our server. Major updates will be posted in this forum thread. Minor updates and tweaks happen along the way without much fanfare. LinuxGaming2 will never be "bleeding edge"; stability is preferred. Before uploading the section maps are processed through pngquant to make their file sizes smaller and easier for uploading/downloading. The "8K" map and the "Main Section" map are processed through optipng. For png files smaller than a megabyte, pngquant seems to work best, however on larger png files, pngquant doesn't have much affect. For larger png files, optipng can reduce their size, somewhat, but it also takes much, much longer. The Teleports map is a grey scale version of the 8K map and shows the destinations of the Travelnet booths and the go-points. Travelnet booths are yellow circles and words. Go-points are red circles and words. The map in the background is greyed-out to make it easier to read the small print of the teleport locations. + Where Can I Build? 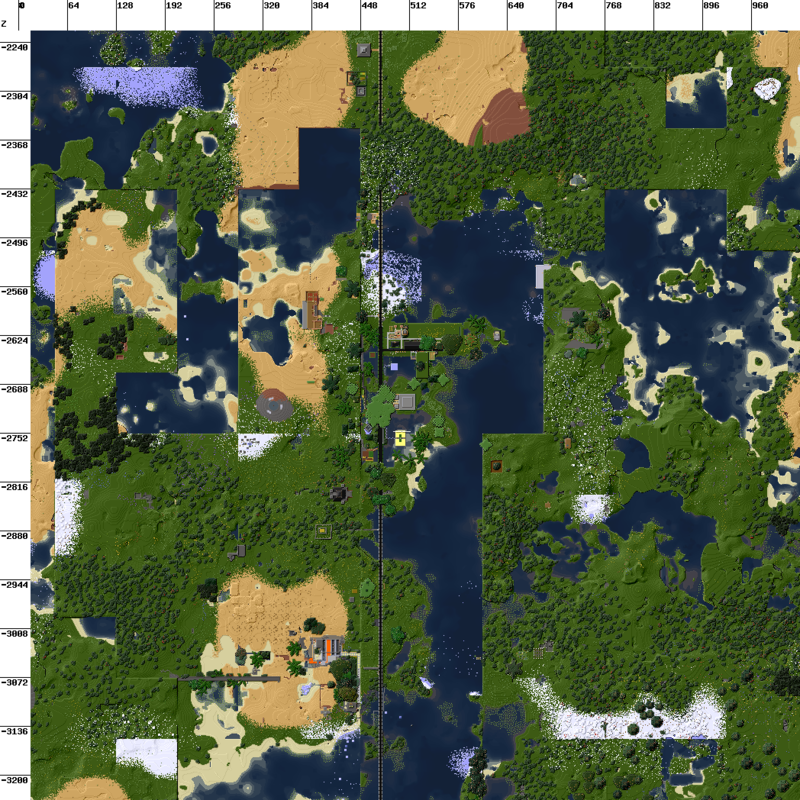 A Minetest world is huge! 60,000 x 60,000 x 60,000 blocks huge!! With plenty of room for everyone there is no need to pile-up and build on top of each other. When you look at a block and see "Owned by <playername>" that means the block has been protected, or "permafied", in that player's name. 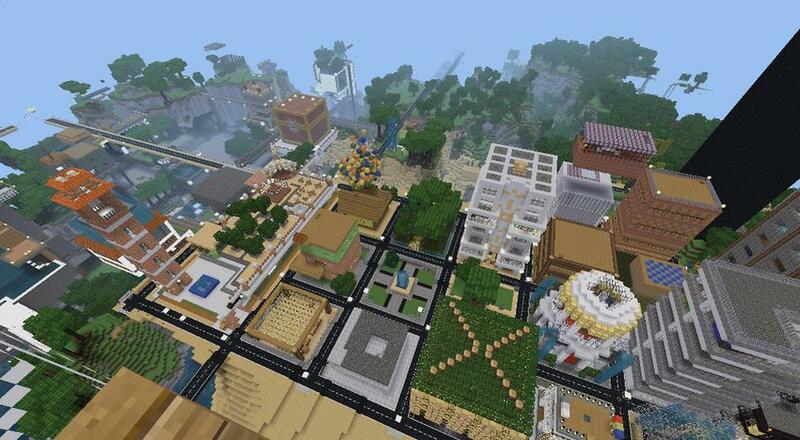 Most of Spawntown has been permafied, so everywhere you look is "Owned by ... ". 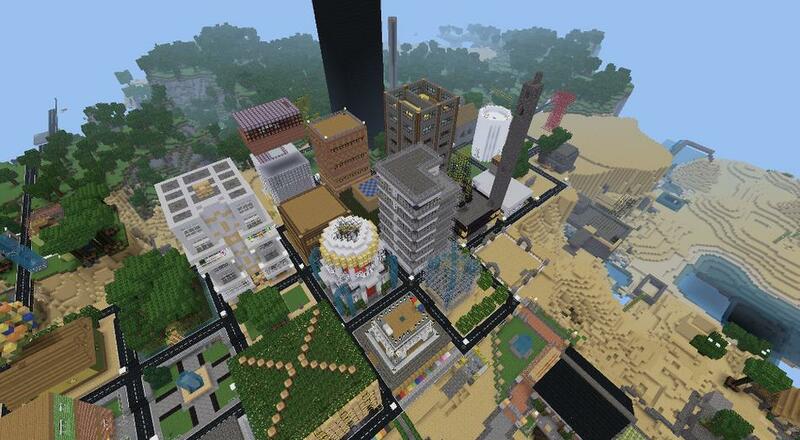 To find a place to mine and build that hasn't been permafied you will have go out of Spawntown. Follow the main roads north, south, east, and west and eventually you will find a spot. The protection status of an area is displayed in the lower-left corner of your screen. If it says "Areas" followed by an ID number and name/title then that area has already been protected and claimed by someone else. Using shadowninja's Areas mod with Sokomine's Markers GUI mod for Areas, players can set protection on their creations by themselves. Staff will not set protection on mines. Mines are too sprawling, overlapping and entagled. kotolegokot's "Money" mod is installed so you can buy and sell ingame items either from shops or from other players. * Note: This is NOT real money; it's just fake, play money. a way for players to trade amongst themselves if the other player doesn't have an item to trade that the other player is interested in. a way to provide players access to items that do not have crafting recipes or are not renewable. 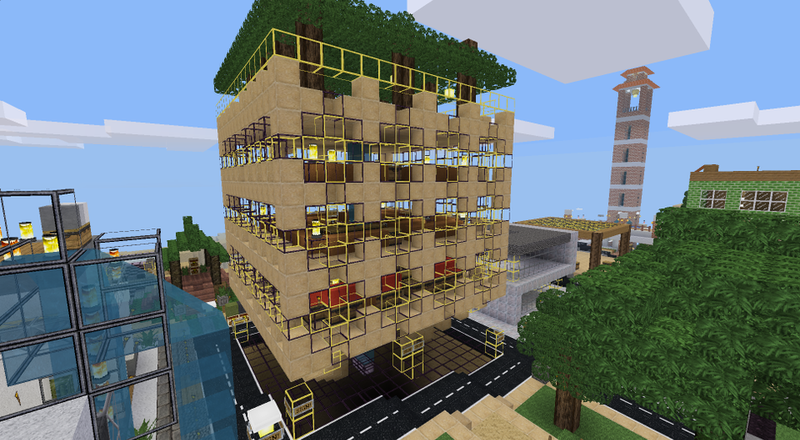 Our server is not for players with fantasies of becoming Wall Street banksters in Minetest. How Much *Money Do I Have? This will display your current balance in the chat area in the upper, left corner of your screen. All players start off with no *money in their account. In order to get *money you will have to sell stuff. Often players will buy and sell directly to each other. Remember when coming up with your sales pitch or haggling a deal, "Honey gathers more flies than vinegar". RealBadAngel's "Unified Inventory" mod provides 4 bags of extra storage in your inventory. Use these to carry your surplus for player-to-player sales. For example, blacksabre_43 doesn't want to buy a full stack of 99, red, wool, blocks because blacksabre_43 just needs 8 blocks, not 99. MegaMiner happens to have a surplus of white, wool blocks in their inventory and some red dye. MegaMiner makes an offer to blacksabre_43... $24 for 8, red, wool blocks. blacksabre_43 thinks MegaMiner's price is too high so both players haggle for a while and settle on a deal of 8, red, wool blocks for $16. MegaMiner crafts the 8 blocks of wool with red dye to sell to blacksabre_43 and then blacksabre_43 pays MegaMiner the agreed upon price of $16. After blacksabre_43 enters the code above, $16 is transfered from blacksabre_43's account and put into MegaMiner's account. blacksabre_43 sees that their account balance is now $16 less and MegaMiner sees that their account balance has increased by $16. The easiest and most reliable way to make *money is to mine cobble and then sell it to the admin shop in the Admin Shops Building. Other materials can be bought and sold there as well at any time, 24/7. The item each shop buys or sells is on top of the shop chest it represents (e.g., there is a block of cobble on top of the shop that buys a stack of 99 cobble for $100). If you plan ahead you can build-up your account with steady mining. Here is an example of how very useful RealBadAngel's "Unified Inventory" mod truly is. You are about to go on a long-term mining expedition. Plan-out what items you will need to survive underground for several days. Move all the things you don't need out of your inventory and into locked chests. Once you have four, empty, large bags and a mostly empty inventory (except for the things that you will need like saplings, dirt, apples, snow, ice blocks (water), torches, tools, glowlights, and rope), head out on your mining expidition for tales of adventure and glory! With four, empty, large bags and a nearly empty inventory you can store a lot of cobble and ores to sell later for *money. Now that you have an inventory and 4 bags full of cobble and ores it's time to sell it. The spawn command, on our server, doesn't "kill" you like it might on other servers. 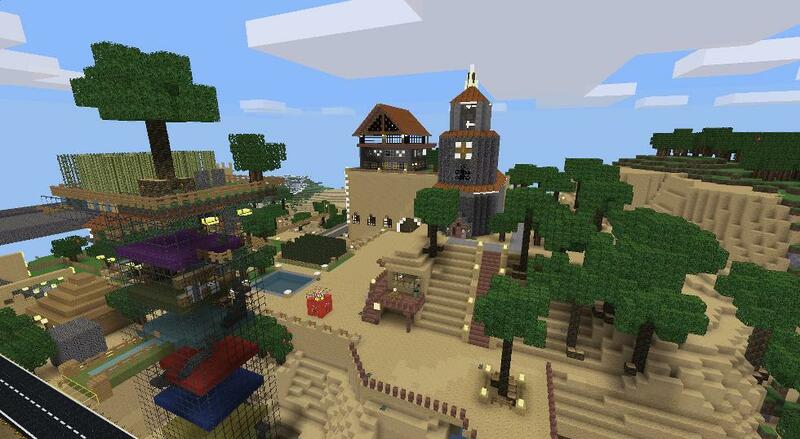 Instead it will teleport you to the spawn building with all your stuff still in your inventory. 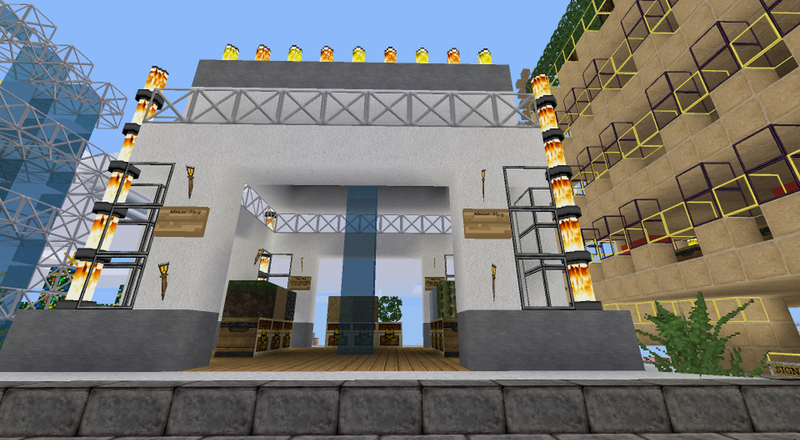 Across the street from the spawn building is the Admin Shops Building (pictured below). The ground floor is where you sell your goods to the admin shops. Vairous items such as dirt, desert sand, cobble, desert stone, desert cobble, wood, leaves, ice, and cactus can be sold to the admin shops. Some items are bought at a better price than others so be sure to check first and plan accordingly. After you've sold your stuff to the shops on the ground floor, you can buy stuff on the top floor. Swim up the water elevator in the middle of the Admin Shops Building to get to the top floor. On the top floor you can buy some of the available, colored wools (red, green, blue, white, grey, dark grey). You can also purchase your own shop chest to buy and sell things to other players. You don't have to be ingame for your shop to make *money for you. Players can buy items from your shop even while you are offline. Be sure to keep your shops well stocked. If your shop runs out of items to sell, then you won't make any more *money. 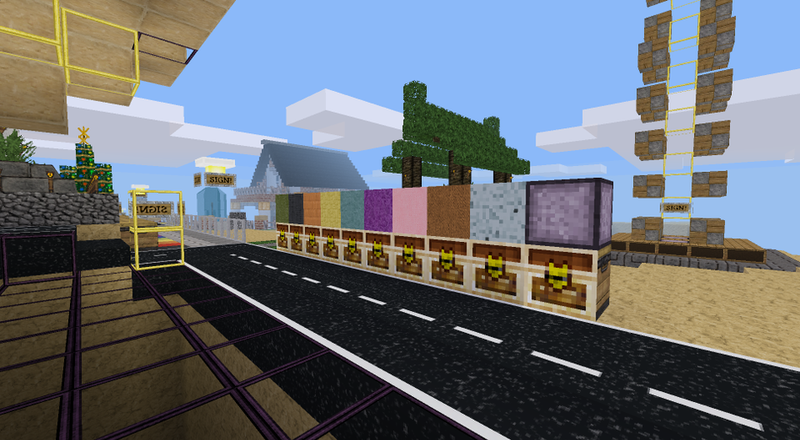 Just off to the west side of the Admin Shops Building are the dye shops. 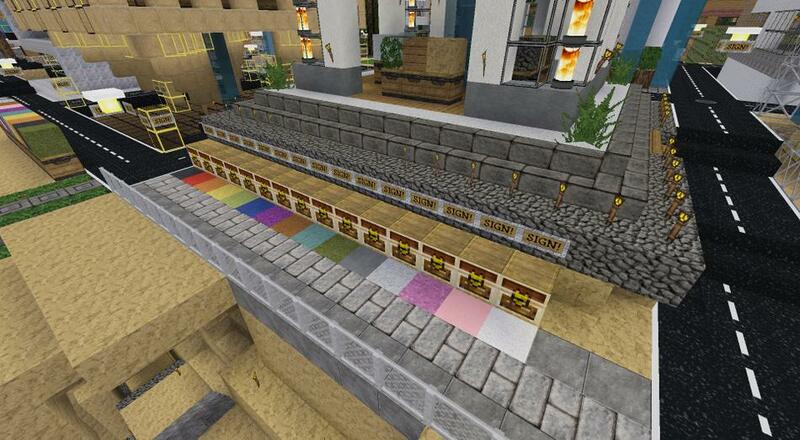 The colored block on the ground in front of each dye shop chest represents the color of dye sold. Before buying dyes, be sure to check if the item you wish to color is capable of changing colors (e.g., you can dye white wool but not cobble or brick). Also check the craft guide for alternate recipes for the dyes. Dyes are made from other dyes but if you study the alternate recipes you may be able to make completely different dye colors from left-over dyes in your inventory. Frugal and effective. The colors of wool that aren't sold on the top floor of the Admin Shops Building (magenta, dark green, black, orange, yellow, cyan, purple, pink, brown) can be found at street level along side of two shops that sell moonrocks (white, bounce pads) and anti-moonrocks (purple; no fall-damage). 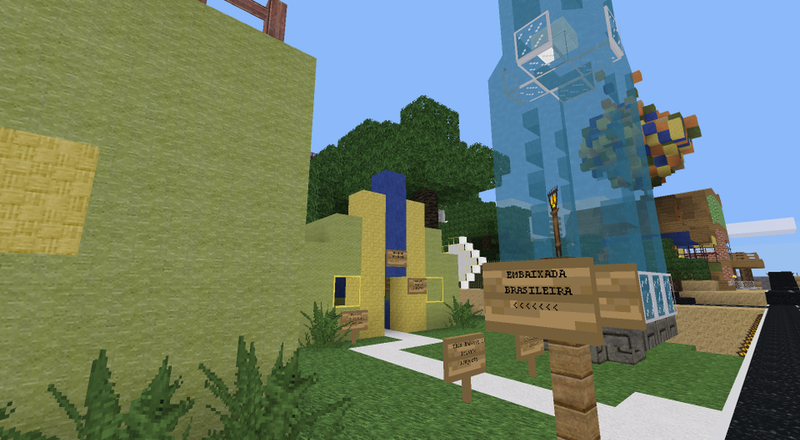 They are just up the street from the Admin Shops Building, between the Sneak Elevator Demo and Mind's Market Tower. 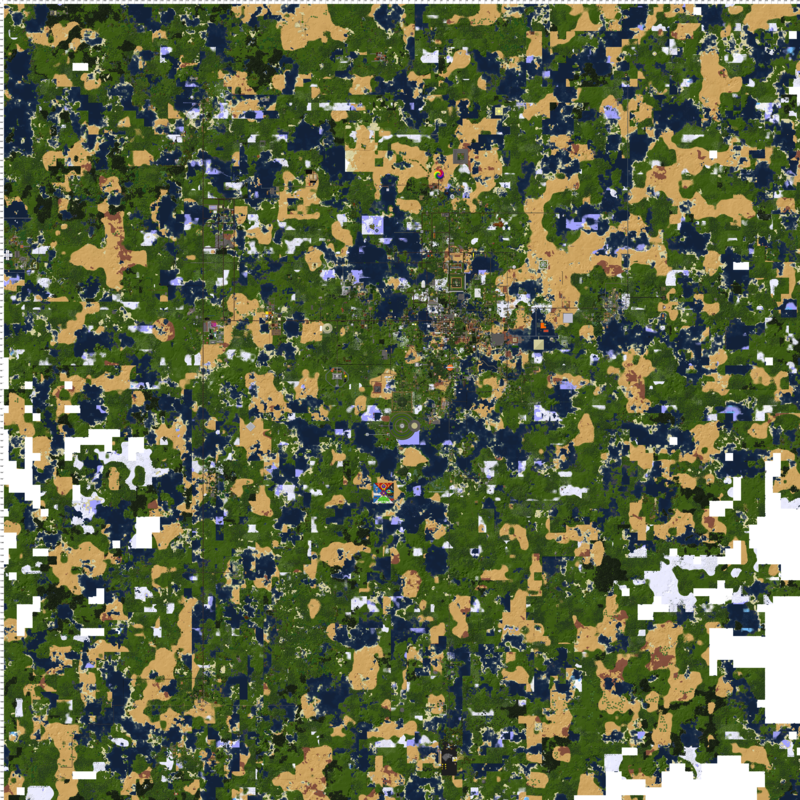 The map-generated clay has been quickly snatched-up from all the near-by areas. Since clay is non-renewable, a store was setup where players could buy clay and use the furnaces in the store to make brick. For those players with a little more money to spend, red brick and green, cactus brick is sold in the shops in the lounge on the top floor of the store. 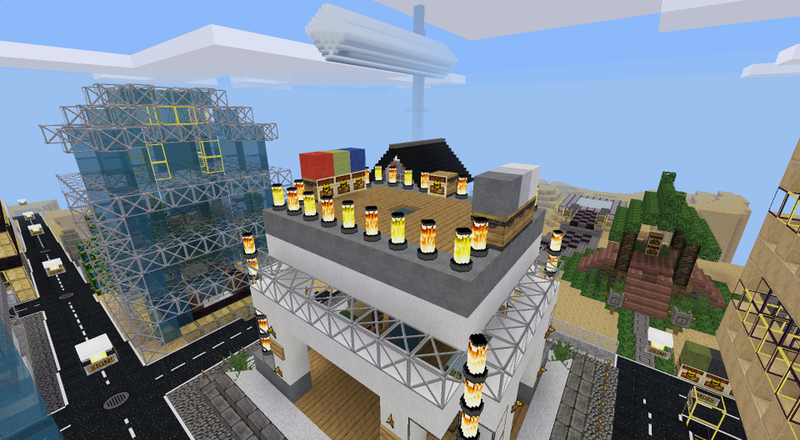 Also on the top floor is a balcony looking out upon Spawntown. If you are on the ground, you can walk along the narrow edge that goes around the building to look over the cliff. 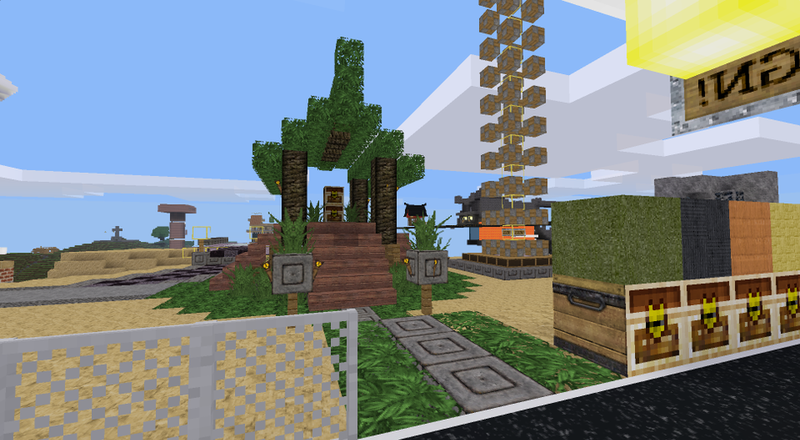 Admin Shop - "Junglegrass Hut"
Our server's world started before jungle biomes where brought back to the default minetest_game. The Junglegrass Hut provides access to junglegrass in large quantities (a stack at at time) or smaller quantities (10 at a time). Players can buy junglegrass and sell back any execess. Over time junglegrass has been made more accessible through other means but the Junglegrass Hut remains the best source for aquiring bulk junglegrass for your landscaping and botanical decorating needs. Originally a flat plot of land, later transformed into a stylish shopping tower, Mind's Market Tower holds several floors for players to place there shops. The top floor has a tree-topped canopy and deck to relax in with the theraputic powers of thefamilygrog66's, "Living Room Furniture" mod's sofas. 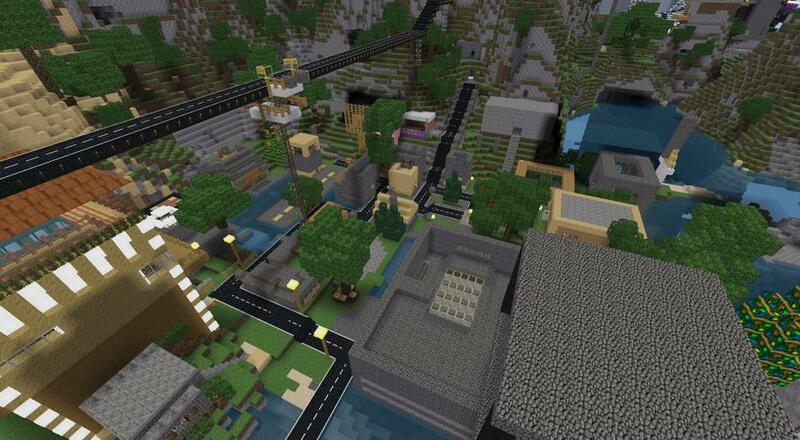 To the north of Spawntown is Old Town. A multi-level market place for players to set up shop. Old Town starts off with a dance floor and open-air dining area overlooked by a stately bell tower. Each level is easily accessable and ready for business. One of the easiest and most reliable ways to make *money is to sell cobble to the admin shop. On the west edge of town, across the street from the admin shop that buys cobble, is the public mine where anyone can mine for as much cobble as they like, as often as they like. 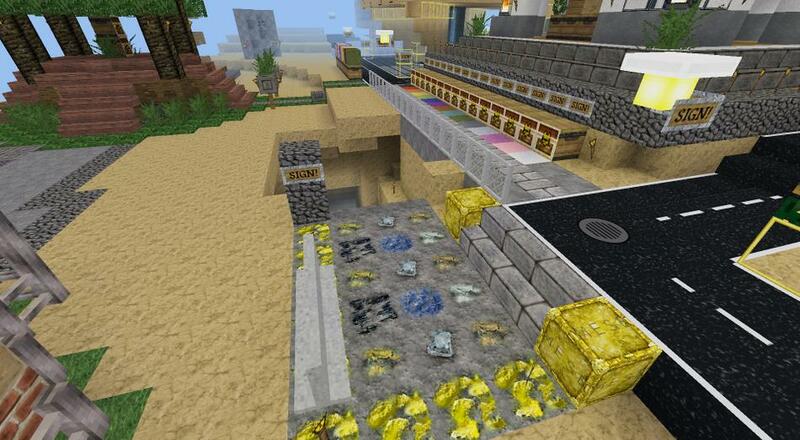 The entry way to the mine is paved with various ores. The surface of the mine and the first few levels of stairs and wijnand's Mining Store are protected, otherwise the rest of the mine is available. The public mine extends to depths where mese and diamonds are more common. Players often don't know the proper item code to enter in the third line, "Name of node that you want to buy or/and sell". This is where the craft guide in RealBadAngel's "Unified Inventory" mod really helps out. By clicking on the item in your inventory's items list that you want to sell (the item's list is the grid on the right side of the inventory screen), the inventory menu will switch over to the craft guide. Above the crafting grid will appear the item's proper code name to enter in the shop's third line. When mining long-term, always carry dirt, saplings, and light sources (torches, glowglass, glowlights, glow-in-the-dark scaffolding) to grow trees underground. You will need dirt and light in order for the sapling to grow into a tree. wood to make tools, ladders, and torches from, and fuel for furnaces for making metal tools (though coal is a better fuel). Always carry snow and ice blocks with you; much more snow than ice blocks as you can create ice blocks from water with snow. Since the spill priv is required to use buckets on our server, snow or ice blocks are the way to transport water. Snow or ice blocks melt when near a torch or lava. Infinite water supplies can be created by digging a 2x2 hole, place 2 snow/ice blocks diagonally from each other in the hole, then place a torch on the surface of the hole next to each snow/ice block. The snow/ice blocks will melt into 2 water sources. The 2, diagonally-positioned, water sources will merge into an infinite water supply. Water is useful when mining because you can create water elevators (drowning has been disabled) and, if you come across a lava lake, water can be used to to produce obsidian, basalt, or pumice. 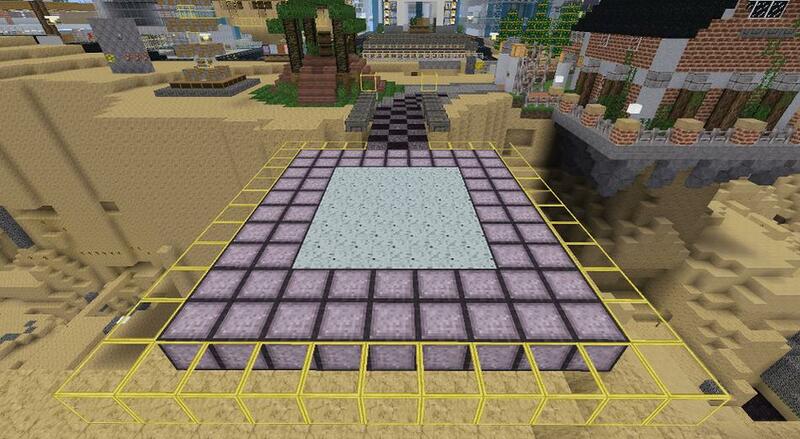 To transport water from your newly created infinite water supply, place a snow block in the water and the water will freeze into ice blocks that can be dug. Always carry in your inventory an armchair from "Living Room Furniture" by thefamilygrog66 to restore your health 100%. These are not the same as the armchairs from "Home Decor" by VanessaE. Apples are great for emergency, quick-fixes but they rapidly run out and only restore partial health. The armchair from the mod, "Living Room Furniture" by thefamilygrog66 is small, cheap to make, reuseable, and just as powerful as the sofas and long sofas. If you are running low on health, but not in an emergency situation, place the armchair, move a step or two away from the armchair, right-click on the armchair, you will be teleported to the middle of the armchair (sitting) and your health will be restored to 100%. Once your health has been restored, dig the armchair back into your inventory for use again later. After you've found a spot for mining, use your second sethome at the bottom of your mine. When your inventory is full of cobble, use the /spawn command to return to spawn and sell your cobble to the Cobble Admin Shop. Then you can use the /home command to teleport back to the bottom of your mine. Make your tools last longer by repairing them. The tool repair setting has been increased to produce a 100% new tool from two, old, worn-out, tools of the same type. For example, if you have two mesepick axes that are almost wore-out (their tool-life bar is red) you can combine both of those old, mese pick axes in the crafting grid to produce a brand new mese axe with full, 100% tool life. Essentially 3 tools for the price of 2. 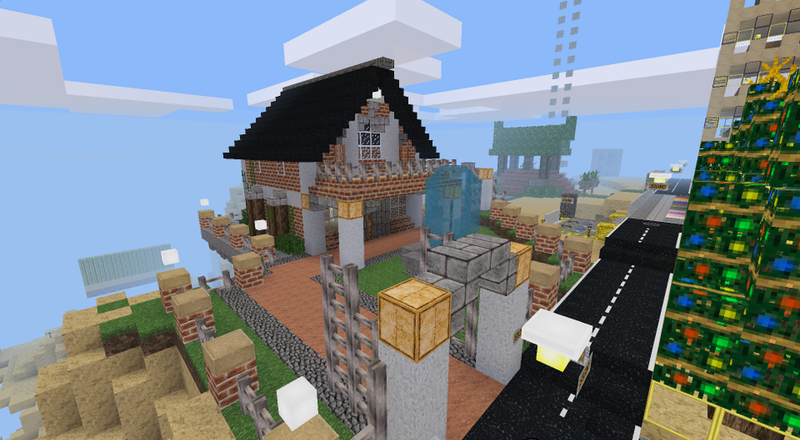 Made of ethereal cloud blocks, Mind's Archive of Coords is the place to have your build's coordinates listed (if you wish) or to find the coords to other builds that players are proud of. 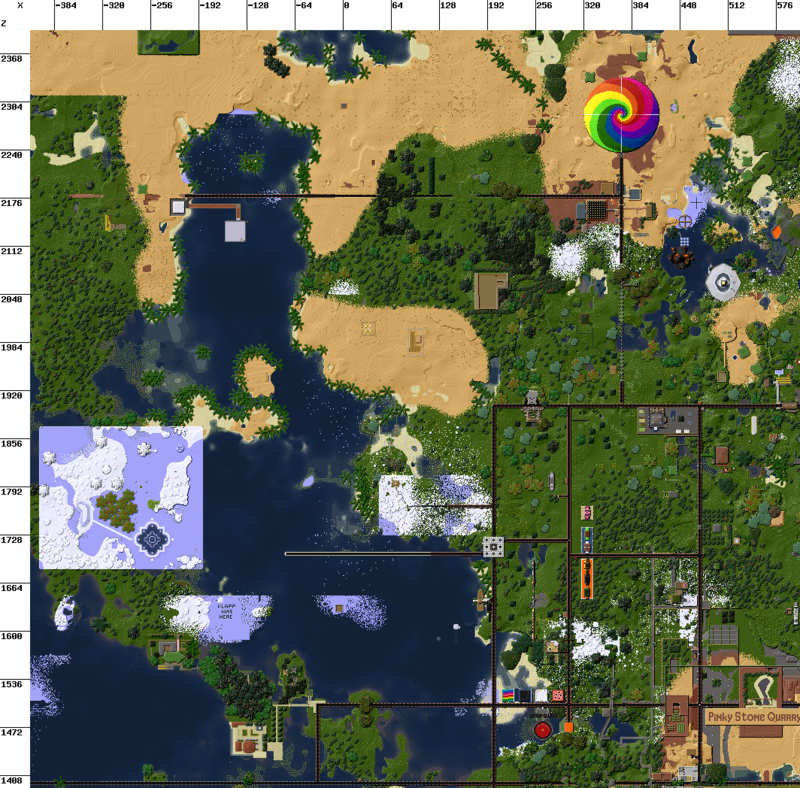 Ok, now that you have the coordinates to a place listed in Mind's Archive of Coords, how do you use them? Clouds drift from north to south, the sun and moon rotate east to west. 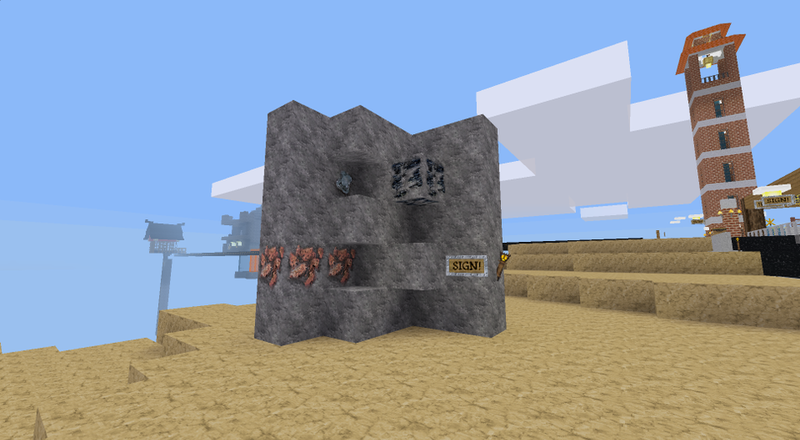 Pressing the "F5" key will display the coords in the upper, left corner of your screen, above the chat and below where it says "Minetest 0.(whatever-version-number-it-is)". To turn them off, press the F5 key again (though it is recommended to leave them turned on). The fist coordinate, "444", is the "x" = east and west directions. The second coordinate, "42", is the "y" = height or depth. The third coordinate, "716", is the "z" = north and south directions. Positive coordinates are east, up, and north. Negative coordinates are west, down, and south. If the coordinate numbers are getting bigger, you are moving east, up, north, or any combination of those three. If the coordinate nubmers are getting smaller, you are moving west, down, south, or any combination of those three. The newer versions of Minetest now include the cardinal direction names in coord line as well as a mini-map that can be toggled on and off. The square version of the mini-map doesn't rotate so North is always at the top. 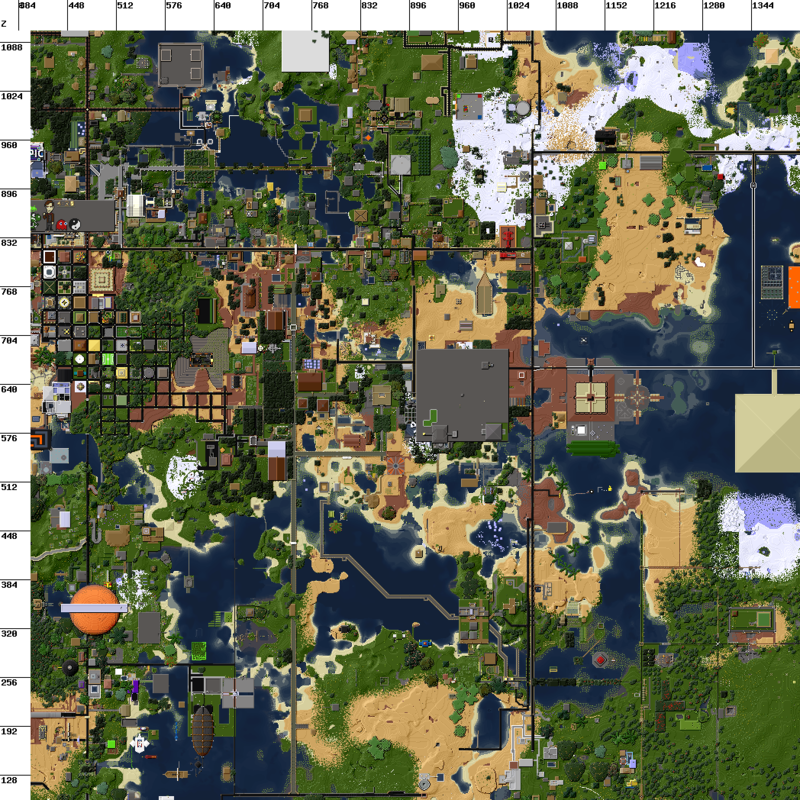 Take a look at the overview maps posted above for examples of how the "coords" can be used. Along the top of the maps is a scale that represents the "x" coord. Along the left side of the maps is a scale thar represents the "z" coord. The y coord, (height/depth) isn't represented. So by looking at the map, Sokomine's Inn is located around 1152,y?,960. 1152 on the x scale along the top of the map. Unknown height (y? ), no y scale. 960 on the z scale along the left side of the map. Two of our custom blocks are moonrocks and anti-moonrocks. To demonstrate what these blocks do a bounce-pad demo was setup. When jumped upon, moonrocks (white) greatly increase the height of a jump (like a trampoline). Anti-moonrocks (purple) are for safe landings. No matter how far you fall, you will not suffer any damage or die if you land on an anti-moonrock. Anti-moon rocks are great for placing at the bottom of mineshafts, sneak elevators, and escape routes. Working on a tall structure? Place anti-moonrocks around there base of where you are working in case you fall off. Moonrocks can make obstical courses more interesting and challenging. When strategicaly placed, moorocks can allow players to quickly jump up to builds high in the sky. Sneak elevators can be constructed for rapid climbs. Either the corner version (like the demo) or the flush-surface version of alternating blocks and spaces. To climb a sneak elevator, move right up against the surface and the hold down the shift and space keys at the same time. To get back down, jump down, close to the surface of the sneak elevator and safely stop yourself by holding the shift key. For getting down faster, place an anti-moonrock pad at the bottom of the sneak elavator for a damage-free landing. Sneak elevators are especially useful when creating mine shafts. Dig alternating spaces as you mine downward. When you want to climb back up to a higher level, going up a sneak elevator is much faster than climbing ladder or rope. To practice climbing a sneak elevator, a four-sided sneak elevator tower was created next to the Sneak Elevator Demo. 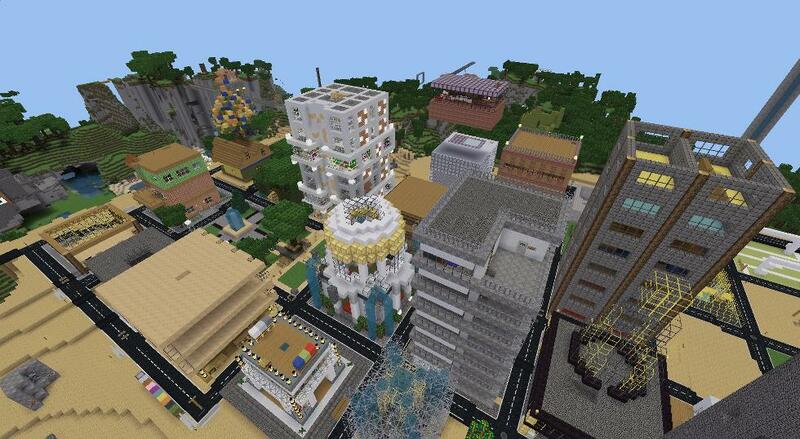 Climb the tower and get a birdseye view of Spawntown and the surrounding area. While at the top, there are mini-water elevators in the floor. You can drift down and walk precarilously along the very edge. Don't let the horizontal ladders fool you. There is nothing preventing you from falling off. * The texture pack used in the screenshots is Calinou's coversion of Misa's texpure pack. Last edited by LazyJ on Sun Apr 14, 2019 02:56, edited 245 times in total. Help, I got griefed. Missing, is 13 glass. Please permafy 50+ block range around it. Because you can't embed an image into a post - you have to upload it to some website such as omploader, imgur, flickr, etc and post a link to the raw image file. It would be good to have beds on this server, mostly to have them as decorative furniture. A sethome command (or travelnet) would also be very useful and will become necessary when the server will grow and people will have to build further out. Another nice furniture mod would be living-room furniture. 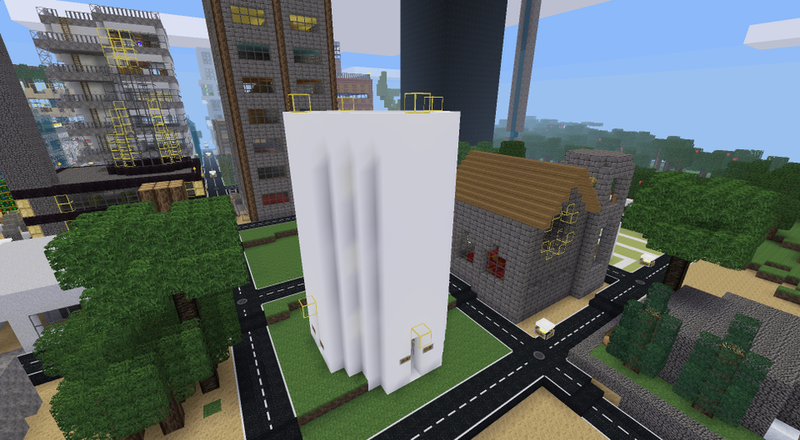 I'm selling apartments that are next to the spawn for $3500 each. Ownership of the apartment will be transferred to your name upon sale, so everything you place in it will be protected. I only have 5 left, so contact me soon if you're interested. Last edited by LazyJ on Thu May 23, 2013 09:50, edited 1 time in total. I was confused about the name changing from WazuClan.com to LinuxGaming.com xD. But it is a cool new name for the server ;). This server is still using 0.4.6. If you update it to 0.4.7 stable, farming and flowers will be added to the server (you will also be able to see what other players are weilding.) If you choose the latest development version, you will get better sound effects for the base game. Rhys wrote: I was confused about the name changing from WazuClan.com to LinuxGaming.com xD. But it is a cool new name for the server ;). 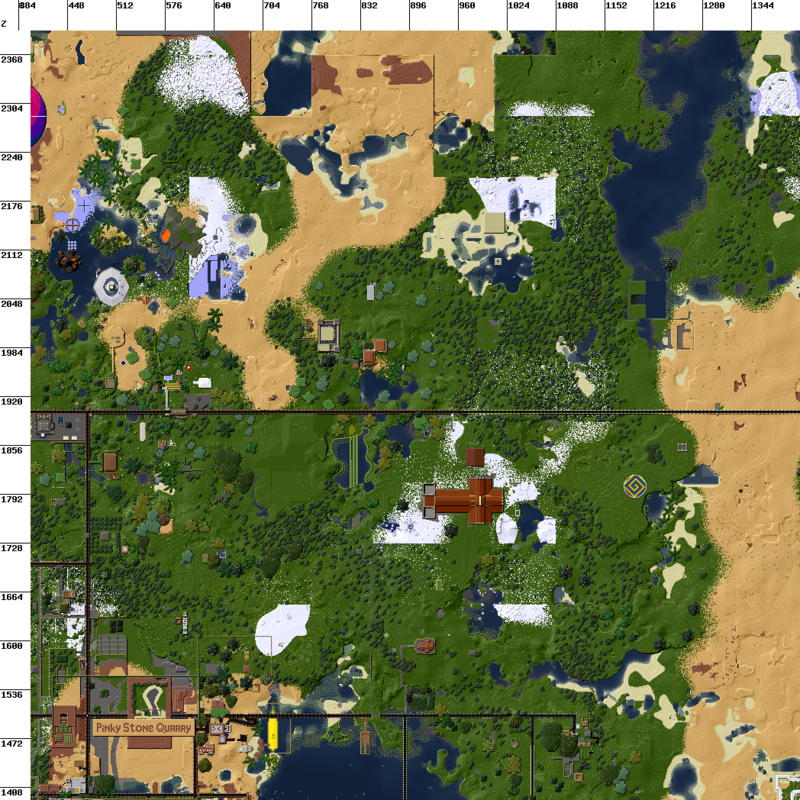 There was a split from the WazuClan that took the Minetest server (Wazuland2) with it as a result. So now Wazuland2 is no longer affiliated with the WazuClan. The Minetest server is still on the same machine, just the domain name has changed. 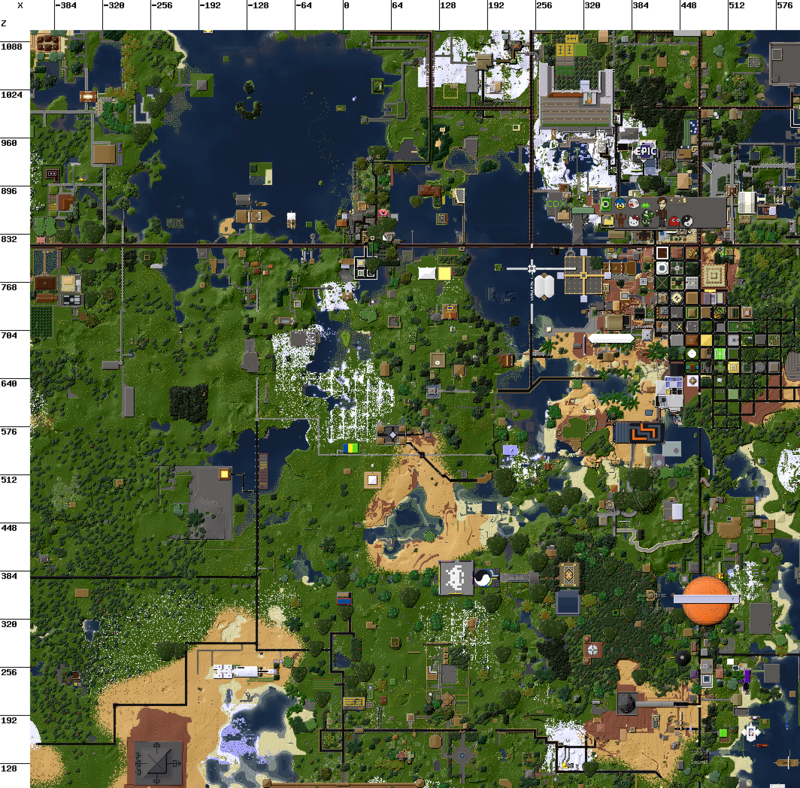 Same map, no wipe, all the Wazuland2 builds are there; just a different domain name. Last edited by LazyJ on Tue Jul 02, 2013 23:20, edited 1 time in total. Also why should we change it? Please Would anyone tell me where I can find this mod permafy? brunob.santos wrote: Please Would anyone tell me where I can find this mod permafy?